The microbes continue attacking! 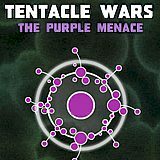 Now you'll have to face purple microbes, which are twice cleverer than other alien microbes and they are very decisive to invade the Green World. Enjoy new levels of this exciting game and try to prevent alien microbes' invasion!